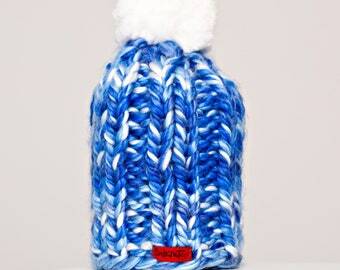 TRUE BLUE hat (for kids) with white pompom! Adorable and soft! Announcement WINNIPEG buyers...if you would prefer to pick up your order, enter the coupon code "WPGPICKUP" at checkout to avoid shipping costs. Items can be picked up from West or Downtown Winnipeg! WINNIPEG buyers...if you would prefer to pick up your order, enter the coupon code "WPGPICKUP" at checkout to avoid shipping costs. Items can be picked up from West or Downtown Winnipeg! 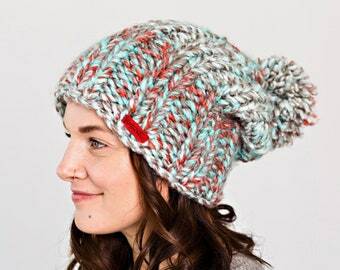 Pastel BUTTERCUP hat (for kids) with pompom! 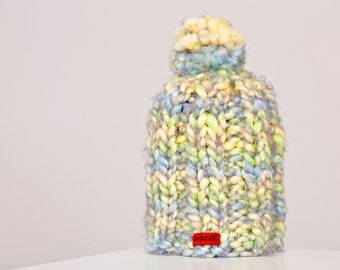 Pastel SWEET PEA kid's hat with pompom! 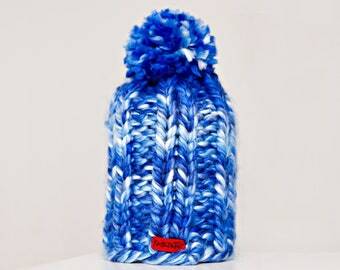 TRUE BLUE hat (for kids) with blue pompom! 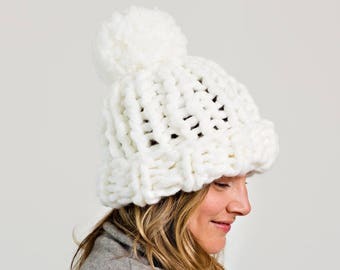 White SNOWBOARDER BEANIE with POMPOM! 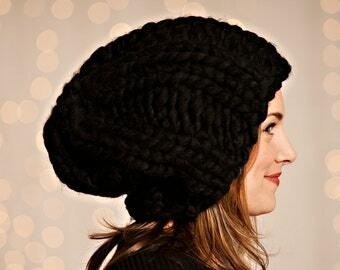 This beanie is such a dream!!! So chunky and cosy - exactly as I wanted it! And a huge plus that it's made from vegan materials! I will definitely get a lot of use out of it. Also, I got a little extra gift with the beanie - so sweet! Thank you so so much! 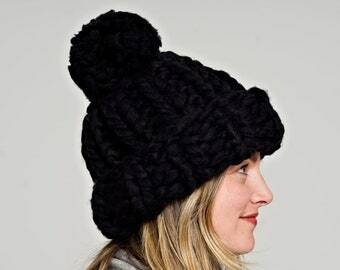 SNOWBOARDER BEANIE with POMPOM!..Vegan knit hat, hand knit, chunky knit, knit toque, knit beanie, knit hat, chunky beanie, vegan gift. 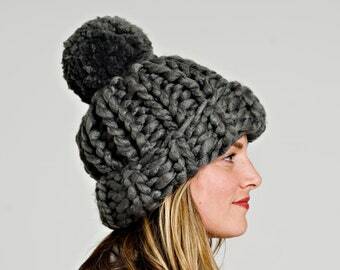 DUBLIN hat with POMPOM!..Vegan knit hat, hand knit, chunky knit, knit toque, knit beanie, knit hat, vegan knit, vegan gift. 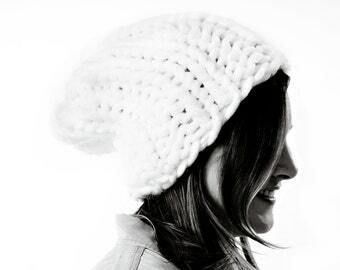 Coralee is the eclectic redhead behind all the knits! First taught to knit by her Grandmother at the age of 7 but she fell in love with CHUNKY yarn & big glittery needles in her adulthood. 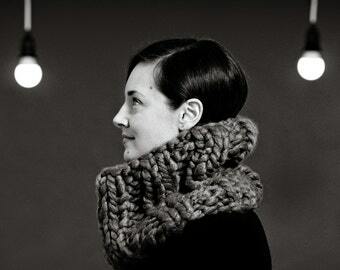 Photographer & Creative Director by day, knitter by night. 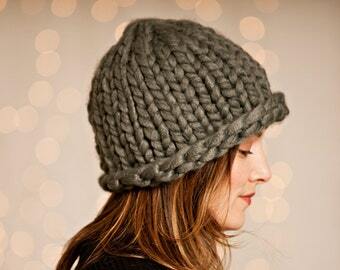 Why vegan knits? Why not!!! There are a few reasons why to choose vegan yarn over wool/other animal fibers. 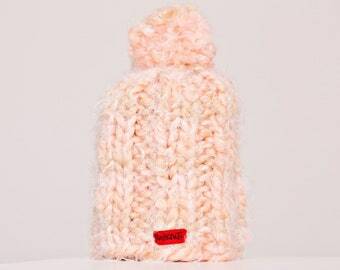 As all Red Knit Co. goods are custom made to order, unfortunately refunds will not be issued. If your Red Knit Co. item arrives to you damaged while in transport to you, please contact me as soon as possible, with a photo of the damage, and we can sort it all out. As customer service is one of my highest priorities, please do not hesitate to get in touch should you have any questions or concerns about your order! All Canadian orders are subject to Federal and Provincial taxes (13% within Canada) and will be added upon cart checkout. Orders shipped outside of Canada, to the United States and Internationally, are not subject to Canadian taxes. SHIPPING WITHIN CANADA is via Canada Post Lettermail service (for oversized items). This is the most affordable way to ship within Canada, saving you more! Tracking is NOT available with Lettermail service. If you would prefer to have it shipped quicker, with tracking, please contact me directly to upgrade your shipping to Expedited service via Canada post. SHIPPING TO THE USA is via Canada Post Letter-post service (for smaller items) and Canada Post USA Air (for hats and cowls). This is the most affordable way to ship from Canada to the USA, saving you more! Canada Post standards for Letter-post/USA Air is 5 to 10 business days, NOT including time going through customs, which can hold your item up for up to an additional 7-14 business days, so up to 20 business days. Tracking is NOT available with Letter-post/USA Air service. If you would prefer to have it shipped quicker, with tracking, please contact me directly to upgrade your shipping to Expedited/Tracked Packet service via Canada post (for approximately $10 more!). SHIPPING INTERNATIONALLY is via Canada Post Letter-post service (for smaller items) and Canada Post International Air (for hats and cowls). This is the most affordable way to ship from Canada internationally, saving you more! Canada Post standards for Letter-post is 4 to 7 business days, NOT including time going through customs, which can hold your item up for up to an additional 7-21 business days, so up to 28 business days. Tracking is NOT available with Letter-post service. If you would prefer to have it shipped quicker, with tracking, please contact me directly to upgrade your shipping to Expedited service via Canada post. 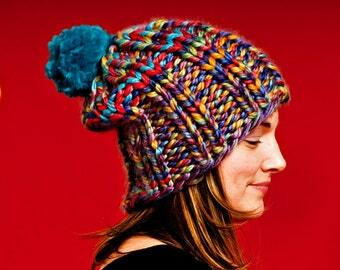 All Red Knit Co. items are made in a smoke free, pet-free environment. We certainly understand and sympathize that people do have allergies (Coralee's boyfriend is pretty much allergic to everything; cats, wool, down duvets!) so all precautions are taken to ensure your item arrives without any issue. If you see something that you like but need it in specific colour or sized to a specific age, get in touch! Custom orders are absolutely welcome!